NASA's Dawn spacecraft captured this image of northern Ceres on April 14 and 15, 2015, when it was about 14,000 miles (22,500 kilometers) above the dwarf planet's north pole. NASA's Dawn spacecraft has photographed Ceres' intriguing bright spots again as it prepares to begin its science mission at the dwarf planet. Dawn, which arrived at Ceres on March 6, imaged the mysterious bright spots on April 14 and 15 during a photography campaign designed to help guide the spacecraft to its first Ceres science orbit by April 23. NASA officials combined the photos into a short video that shows Ceres' bright spots moving as the dwarf planet rotates. The bright spots' makeup is just one of many mysteries Dawn will explore with the beginning of intensive observations on April 23. Those initial observations will be made from a circular orbit about 8,400 miles (13,500 km) above the dwarf planet's surface. 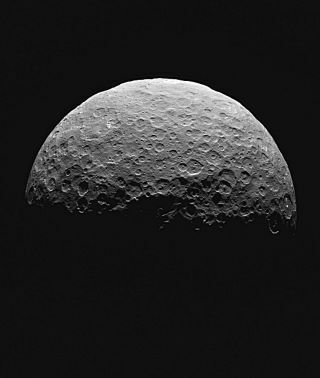 Then, on May 9, Dawn will begin spiraling closer, to get even better views of Ceres, which, at 590 miles (950 km) wide, is the largest denizen of the main asteroid belt between Mars and Jupiter. The $466 million Dawn mission launched in September 2007 to study Ceres and Vesta, the asteroid belt's second-biggest body. Both objects are intact protoplanets left over from the solar system's early days; investigating them should reveal key insights about how rocky planets such as Earth came to be, mission officials have said. Dawn orbited Vesta from July 2011 to September 2012, when the probe departed for Ceres. Dawn is scheduled to keep observing the dwarf planet until June 2016, when it will run out of fuel. Dawn is the only spacecraft ever to orbit two different bodies beyond the Earth-moon system, and the first probe to study a dwarf planet up close. Another NASA probe is about to get a good look at the solar system's most famous dwarf planet: the New Horizons spacecraft will zoom past Pluto on July 14, lifting the veil on a body that has remained mysterious since its 1930 discovery.